The 23-year-old singer was pelted with the fruit after singing his single Kiwi during a concert at Hammersmith Apollo in London. He lost his footing and nearly fell to the floor after slipping on the pulp. Styles reflected on the incident to pal Nick Grimshaw on his Radio One Breakfast Show, joking that he was thankful he hasn't been "hit straight on with a kiwi yet". A branch of supermarket chain Asda in Hulme, Manchester, decided to take it upon themselves to prevent a frightening Chinese gooseberry-induced accident by checking the ID of anyone making a kiwi purchase that looked under the age of 25. An ASDA spokesperson said: "We know our customers love Harry Styles and we feel it's our duty to protect a fellow Mancunian from any 'bad kiwis' amongst us. "We'd hate to see a repeat of the mishap this evening, so to avoid any slippery situations, we feel this is a necessary measure," Evening Standard reports. After slipping up on a kiwi on stage earlier this week, showman Styles styled it out with a dance, but nothing could hide his surprise. He told the 5,000-strong crowd: "You may have seen me fall earlier during this song. It appeared to be a kiwi. "That was the culprit, some green seedy mush. Look there's another - this could end up being a problem" he added. One fan recently posted a clip of Styles slipping up on the slimy green fruit on Twitter with the caption: "harry styles tripping on a kiwi while singing kiwi is the best thing I've ever seen". Styles will feature on BBC1 this evening in a special tribute to his new music called Harry Styles at the BBC, hosted by Grimshaw. The one-off programme will see him perform tracks from his eponymous debut album, including the song that launched his solo career, Sign of the Times. 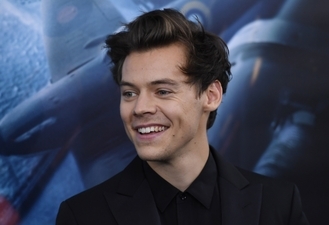 He will chat to Grimshaw about his career to date in between numbers and what it's been like as a solo artist and a rising actor, having appeared in Christopher Nolan's acclaimed war movie Dunkirk earlier this year.